FAIRFAX, VIRGINIA- The National Rifle Association is pleased to announce that Henry Repeating Arms has generously donated 50 Henry Lever Action Youth Rifles to NRA’s Youth Programs Department, furthering their support of youth involvement in the shooting sports. “Henry Repeating Arms takes great pride in continuing their strong support of youth shooting sports programs,” said Anthony Imperato, President of Henry Repeating Arms. 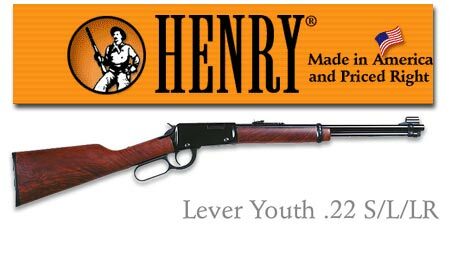 The Henry Lever Action Youth Rifle is a .22 caliber firearm featuring an American walnut stock, fully adjustable rear sight, 12-round capacity, a 13-inch length of pull, and the famously smooth Henry action. This lightweight and compact version of the Henry Lever Action Rifle is ideal for young shooters, or adults who desire a compact rifle in the field. Each donated rifle also comes with a gun case. Numerous shooting sports programs for youth will benefit from this generous donation, including NRA Youth Cooperative Organizations such as the Boy Scouts of America, 4-H, Royal Rangers, National High School Rodeo Association, and the National Scholastic Sportsman’s Program, among others. The rifles will be given as prizes and used during shooting events and training. For the past two years, NRA’s Youth Programs Department has provided Henry rifles to the National High School Rodeo Association to support their Light Rifle Championships. “These rifles from Henry Repeating Arms will help to further youth shooting sports programs across the country. Many young people will have the chance to use these rifles for training and competition. We thank Henry for their continued support and dedication to keeping youth involved in the shooting sports,” said Larry Quandahl, Manager of NRA’s Youth Programs Department. To learn more about Henry Repeating Arms, or to receive a free catalog, call 1-866-200-2354 or visit www.henryrifles.com. For more information on NRA’s Youth Programs Department, call (703) 267-1500 or visit http://www.nrahq.org/youth/. Previous articleLong Hunter launches a redesigned web site and a new gunleather shooting system.